I don't often post about haircare; I did write a post here about my current haircare routine but I haven't tackled the 'day-old hair' issue or talked much around the products that I rate. Sadly this is a 'disappointing products' post; similar to one I wrote here, and I don't often have cause to write these but I've been so let down by a couple of dry shampoos recently I thought it would be good fodder for a blog review! 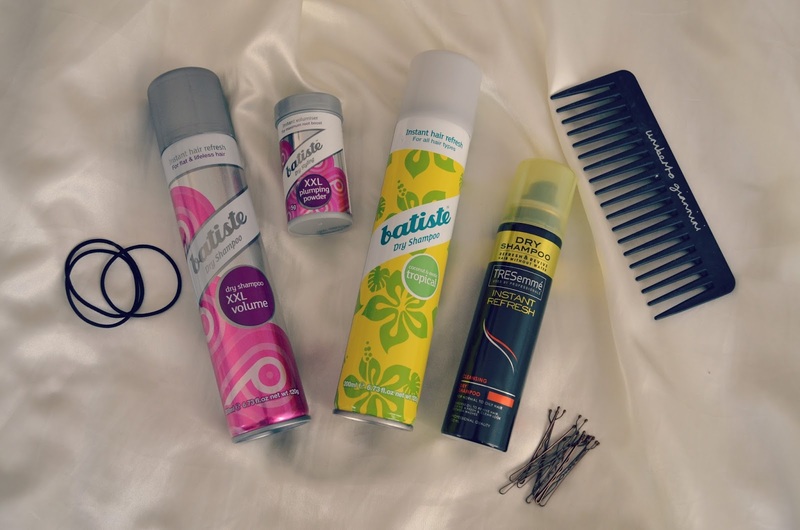 I have to prefix this rant by saying that I would always choose Batiste for dry shampoo; they are known by reputation as being one of the best and I would certainly agree with this to an extent, though I wonder now whether they have been caught up by some other brands and haven't been quick enough to move their products on. The tropical Batiste I actually love; I've included it here as I've finished it and I will potentially buy another, I am looking to try the Ruth Crilly Co-Lab range but can't seem to get my hands on it anywhere, but hopefully I'll be able to find some! The only drawback to the tropical Batiste is the powdery residue it leaves, which is really obvious on my dark roots, but apart from that, it does everything it is supposed to! So, I suppose I should begin with a deconstruction of a dry shampoo; in case there should be anyone who has never used one. The premise of these products is that they absorb the oil from the roots of your hair, meaning it is refreshed and looks clean without having to be washed. I have such a mane of hair and I also have a fringe, I usually wash my hair every 3-4 days as it is such a mission to wash and dry, but normally by day 3 my fringe is looking a little ropey so I will pep it up with a blast of dry shampoo. They are also great for giving texture if your hair is very silky and won't hold a style, dry shampoo can add a bit of 'guts' to your hair making it easier to manage. Dry shampoo 101 over, as I said I usually pick Batiste as I've used the brand before and always found it to do what it says on the tin. So I thought I'd try the XXL volume range when my Tropical Batiste ran out. My hair is long so sometimes the weight of it pulls it down at the roots, making it look flat. So, hopefully, this Batiste product would be able to put some of the oomph back! WRONG! I applied it as I do my usual dry shampoo, to the roots of my hair, and it applied well, but as soon as I tried to massage it in, I knew that it wasn't working for me. It instantly made my hair feel like straw; dry and weirdly rigid, my fringe was sticking up on end like Worzel Gummidge and try as I might, it wouldn't dissipate! Even brushing it through didn't work; it just made my hair stick out straight! I have tried it a few times as I wondered if I was applying it incorrectly or if my hair was too greasy/too dry/too tangly but to no avail. I've given up on it because it actually makes my hair look worse than before I applied it! I have also tried the 'Plumping Powder' which makes the same claims as the shampoo; and this is just as bad if not worse. It's impossible to get a good measure out of the tub, as you either sprinkle on a tiny useless dusting or it comes cascading out of the dispenser in a murky cloud. It sits on your head like dandruff and then refuses to add any volume, only the same inflexible rigidity that the shampoo offers. So disappointing! I also used the Tresemme Instant Refresh dry shampoo, and again, this was a bit, well, dry! It definitely wasn't up to the standard of Batiste (the Tropical one, not the XXL Volume!) and whilst I liked that it was clear, not powdery (no grey roots!) it didn't actually seem to do much at all. I have almost finished this product so it definitely wasn't unusable, as the Batiste ones were, but it didn't work as well as I had hoped it would. Please feel free to recommend some good dry shampoo in the comments that I can try! Or please advise if there is a trick to getting the best from the XXL Volume range, as at present it's set for the bin!